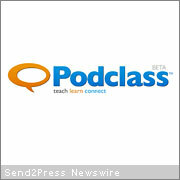 SAN DIEGO, Calif. — Podclass, Inc. announces that their new web services technology that interfaces with Moodle, the leading open-source learning management software system, built on Facebook Platform has been awarded a grant through Facebook’s fbFund. The announcement was made today at f8, Facebook’s annual developers’ conference, and helps deliver on Facebook’s mission to give people the power to share and make the world more open and connected. In an effort to grow the Facebook ecosystem, fbFund was introduced last year to provide resources to developers by eliminating some of the challenges of starting a company. Through fbFund, Facebook hopes to encourage entrepreneurs to build compelling businesses on Facebook Platform. There were more than 1,000 applications submitted, but only 10 applicants were provided with grants. With over 90 million active users, Facebook is the fourth-most trafficked web site in the world. So, why not include an application that millions of users can use within Facebook to access their educational classes on line? The fbFund winning applications were evaluated based on the following criteria: originality of concept – does the application introduce an idea in an unexplored area? ; target market – is the application targeted to key cohorts and does it meet compelling needs? ; social/useful – does it deliver real value to users? ; expressive – does it allow people to share more information? ; intuitive – is it compelling and easy to use? ; potential – can it be a real business someday? ; and team – can the team execute to succeed? In 2007, Facebook launched Facebook Platform, a development platform that enables developers and entrepreneurs to integrate with Facebook and create meaningful social experiences for millions of users. Facebook provides unparalleled potential for applications and the opportunity to build a business that is highly relevant to people’s lives. Facebook(R) is a registered trademark of Facebook Inc. All other trademarks acknowledged. For more information, visit: http://www.Facebook.com.